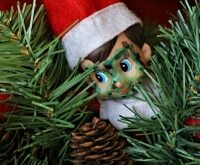 The big old fir tree is a Christmas classic, but why not mix it up this year by adding one or a few of these little faux Christmas trees to your repertoire? 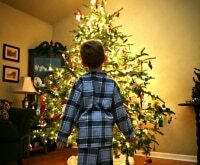 With their wide range of materials, colors and designs, you can easily find a tree to match your decor. And at this busy time of year, a crafting session can feel like a nice change of pace, especially if you can DIY with family and friends. 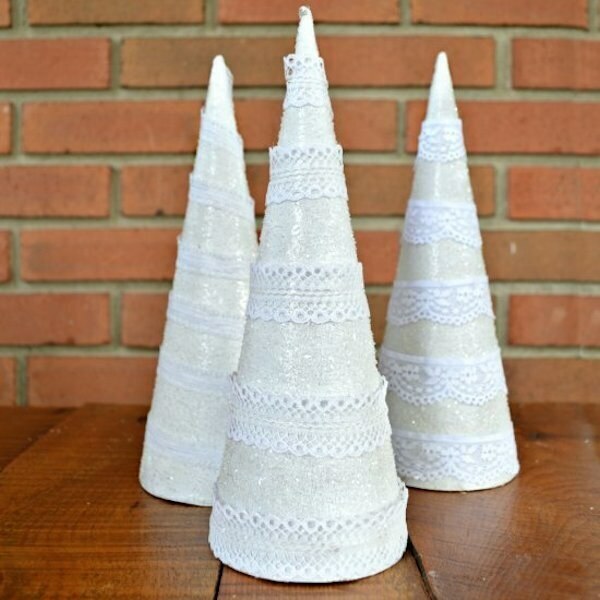 All you need to make these pyramidal little trees is felt, a wooden bead, these circle templates, and hot glue. Print the templates onto cardstock (you could use regular paper too, you’ll just have to trace more delicately), then cut 32 circles out of your felt, two from each of the templates. 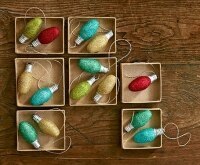 Stack the circles from largest to smallest with a dab of hot glue in between, and top with a wooden ornament. 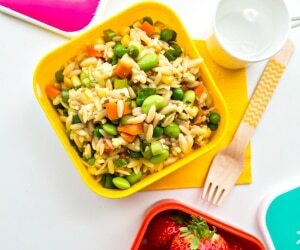 You can keep the palette simple with two alternating colors or go for a wider range of hues. 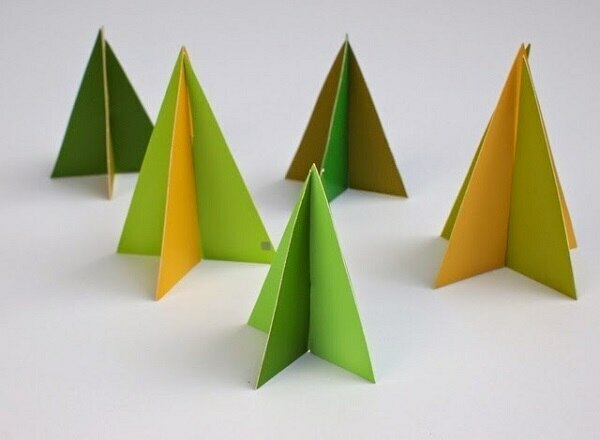 These minimalist paper trees are made out of paint sample cards, which are free and come in an endless array of colors. 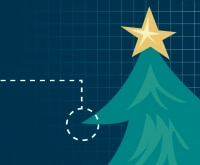 Simply cut the cards into triangles with slits in the middle so they’ll slide together to form a coned tree shape. These shimmery trees are both festive and elegant. 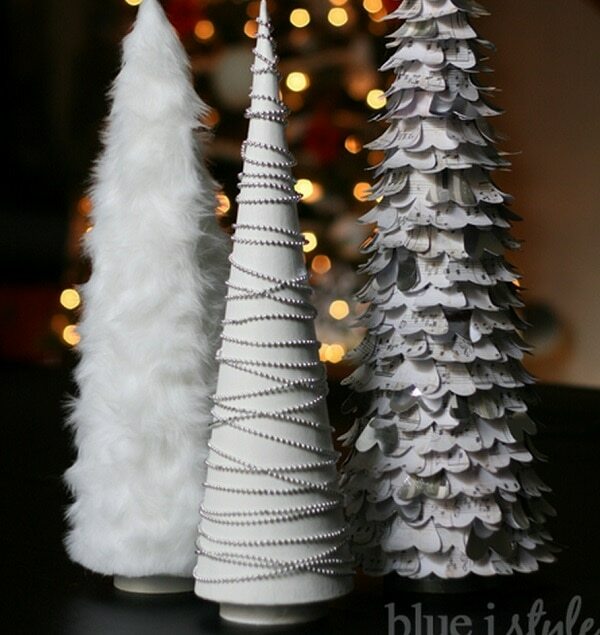 The bases are paper mache cone trees, which are decorated with a heavy layer of glitter and wrapped in lace trim. 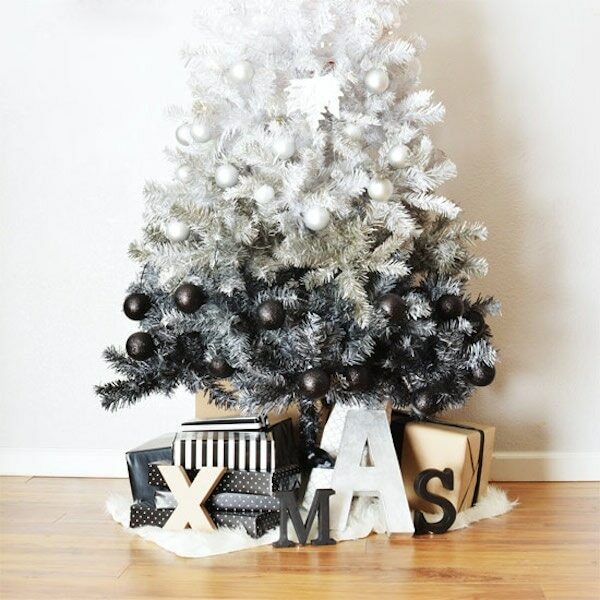 An ombre black-to-white Christmas tree is a modern and unexpected spin on your classically colorful evergreen. It’s easy to make, and just requires some strategic spray painting. 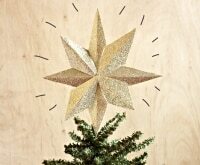 This charming wooden tree is ideal for ornament display in a small space, and folds up easily for storage. To create one, cut wooden dowels into progressively shorter lengths, drill a hole in the middle of each, and slide them onto a central wooden rod. 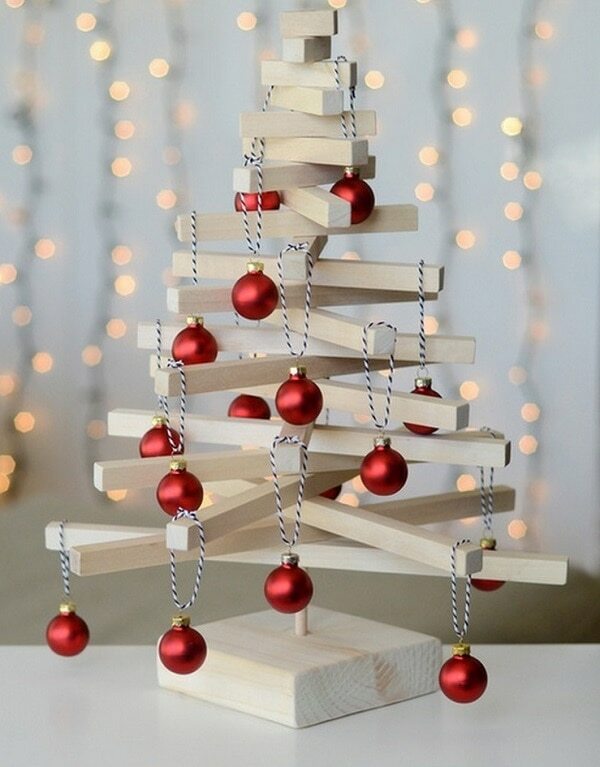 No matter how small your living space, you can make room for this chic 2D Christmas tree. 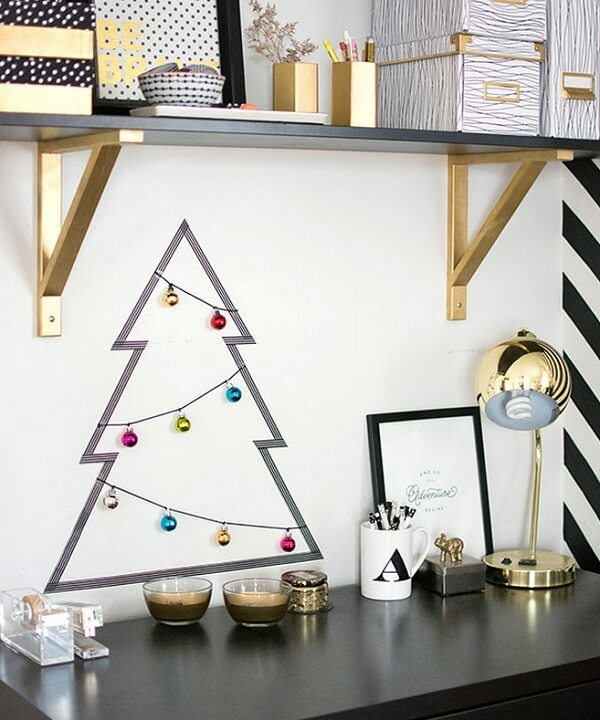 Simply adhere Washi tape to the wall, and decorate with ornaments hung on bits of string. These three chic trees go together without matching entirely. To make your own set, decorate paper mache bases using faux fur, a bead garland, and paper hearts (using sheet music for the hearts looks especially beautiful). 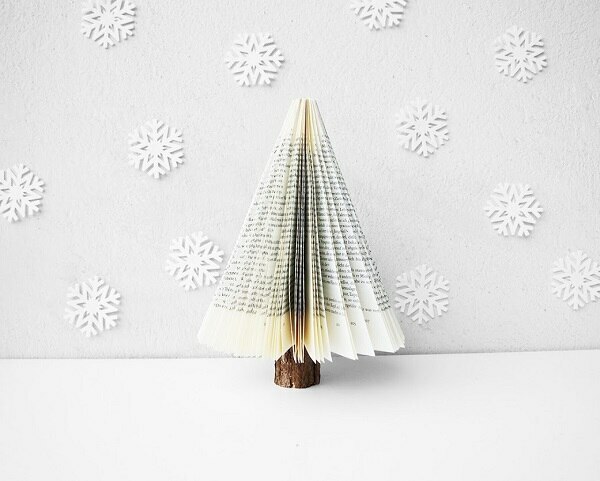 The only trick to this tree is finding a book you don’t mind decimating. 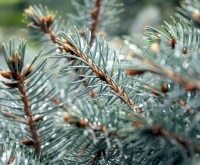 Once you have, simply slice through all the pages and open them up to form the body of the tree, then glue on a thin branch or log as the tree stump. 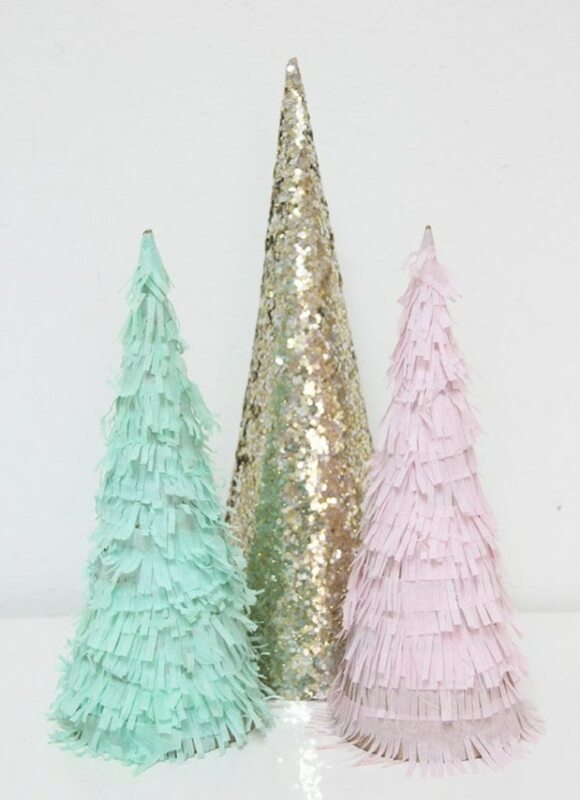 These frilly pastel trees are a playful addition to Christmas decor. 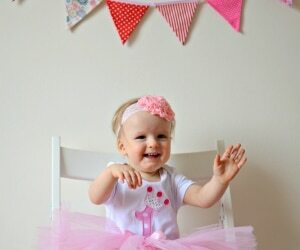 Simply cut into strips of tissue paper to create fringe, then adhere the strips to a cone base using double-sided tape. A glitter tree makes for fabulous contrast. These sparkly trees are guaranteed to set the party mood. 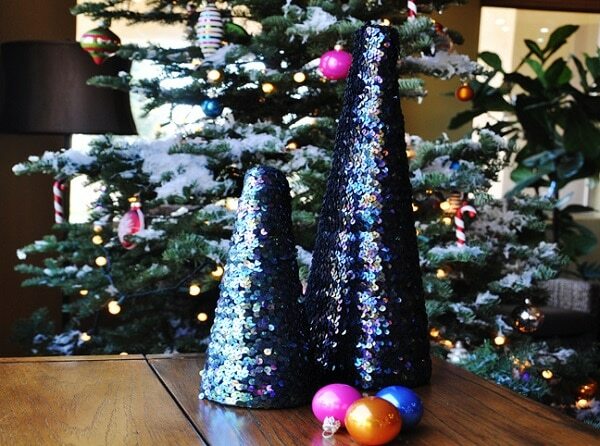 Using trim instead of individual sequins makes covering the cone base a less tedious task. 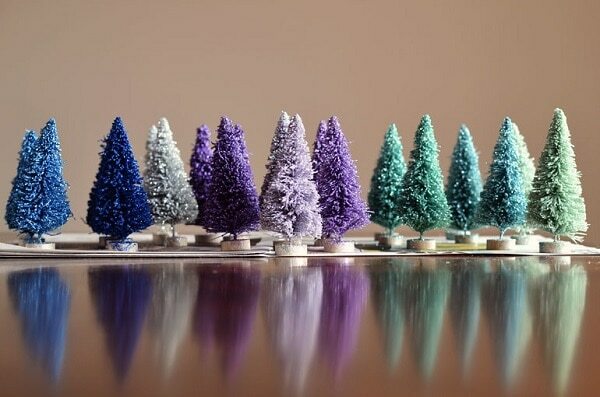 These adorable little pipe cleaner trees can be stand-alone decor or can be used as ornaments on the big fir. To make, simply wrap wire pipe cleaners around foam bases, and add a little bell for the stem. Mix up your wrapping techniques to create different looks. 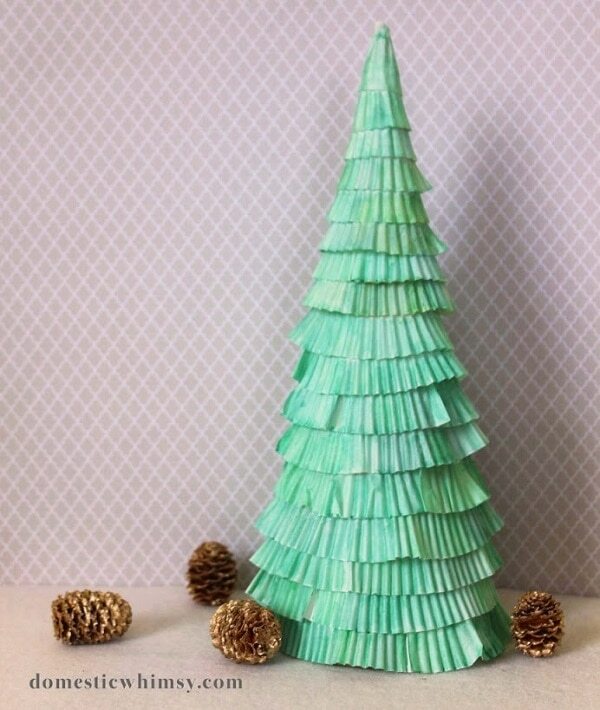 Stack squares of paper onto an awl to create this geometric tree. 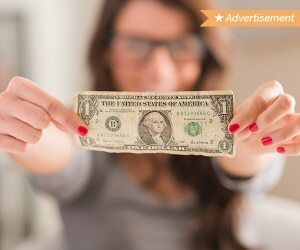 Using a variety of papers, from newspaper to booklets, creates visual interest. Finish it off with spray glue and a layer of pearl dust. 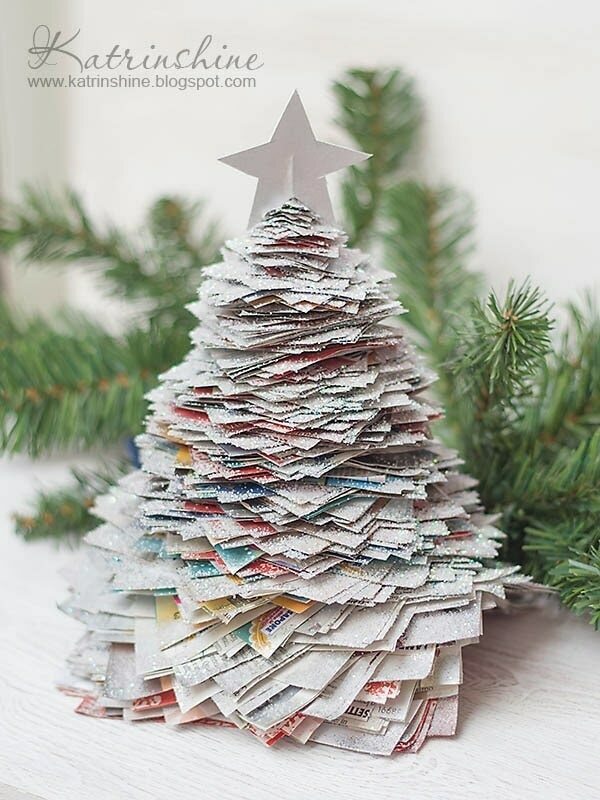 You’ll find the materials for this delectable tree in your baking stash. To make, layer the ruffled edges of cupcake wrappers onto a cone tree base, then paint with watercolors for a softly colored effect. 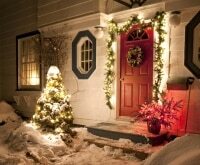 White with pops of red evokes Christmas while still looking chic. 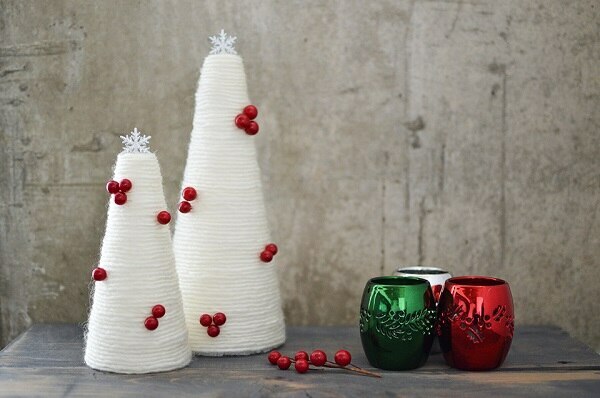 To make these elegant trees, wrap a foam base with yarn, gluing as you go, and embellish with faux red berries. 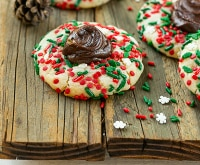 Top them off with mini faux snowflakes. 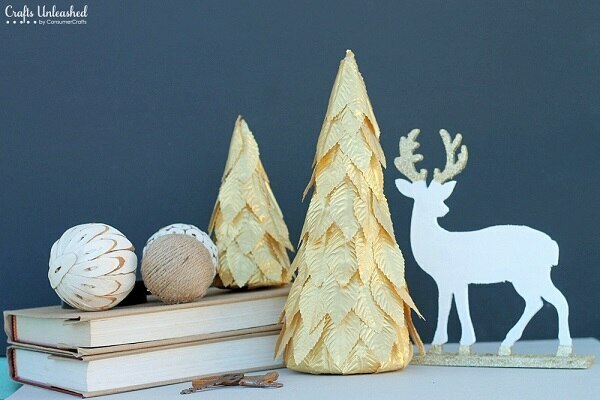 These shimmery minimalist trees are oh-so-easy to make. 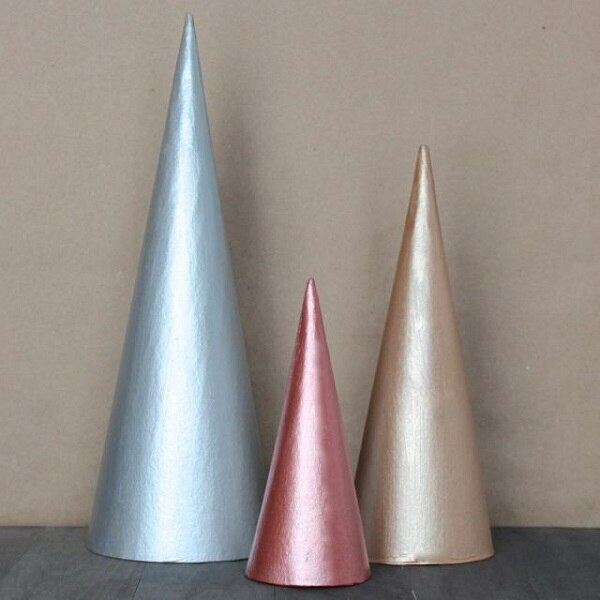 Simply paint paper mache cones with various shades of metallic paint, and don’t be afraid to break out of the usual yuletie palette with pink and bronze. 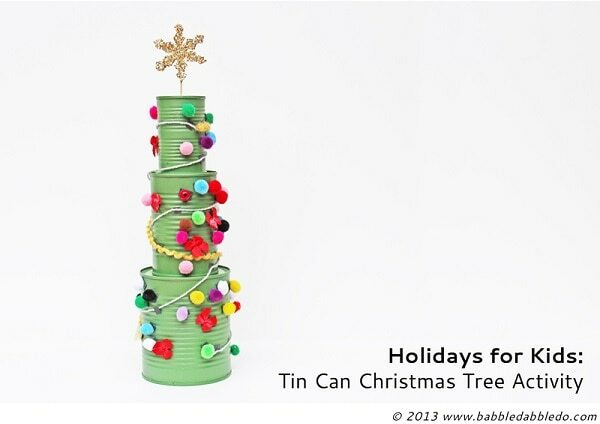 This wacky tree is a fun project to do with kids. 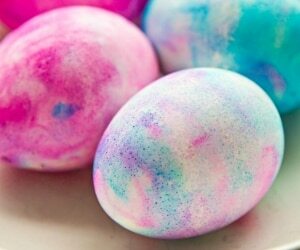 Spray paint tin cans, hot glue them together, and have fun decorating with pompoms and other embellishments. 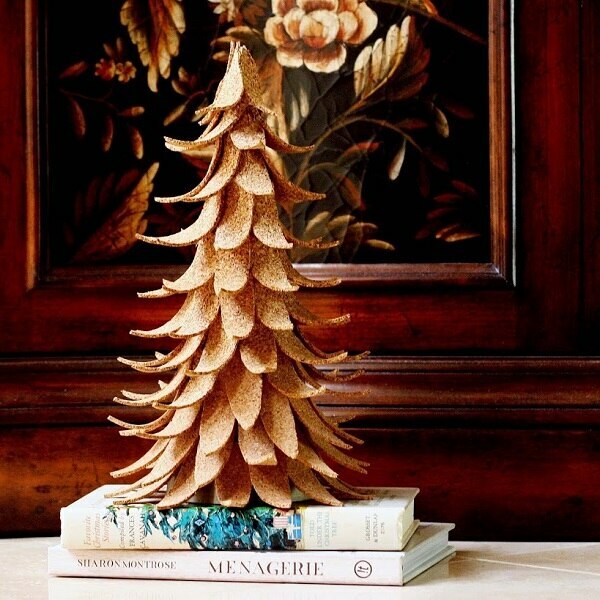 This shining tree looks impressive, but it’s quick and easy to make. 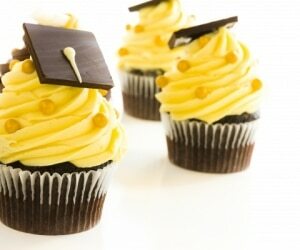 Simply stick gold leaves into a foam cone base, adding a touch of hot glue here and there for a bit more security. Return cork to its original state by transforming it into a tree. 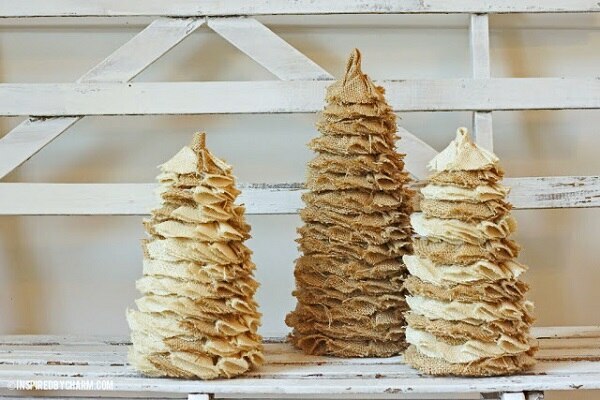 Cut a roll of thin cork sheet into leaf-like shapes, taking advantage of its natural tendency to curl, and adhere the pieces to a paper mache cone base. This whimsical winter wonderland scene is easy to replicate. Bleach bottle brush trees, then spray paint them in shades of blue, purple, and green. 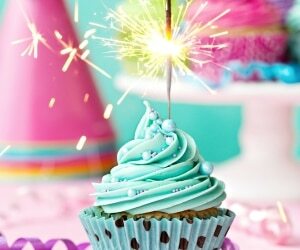 Finish them off with a sprinkling of glitter. Turn this simple school supply into a tree you can count on. 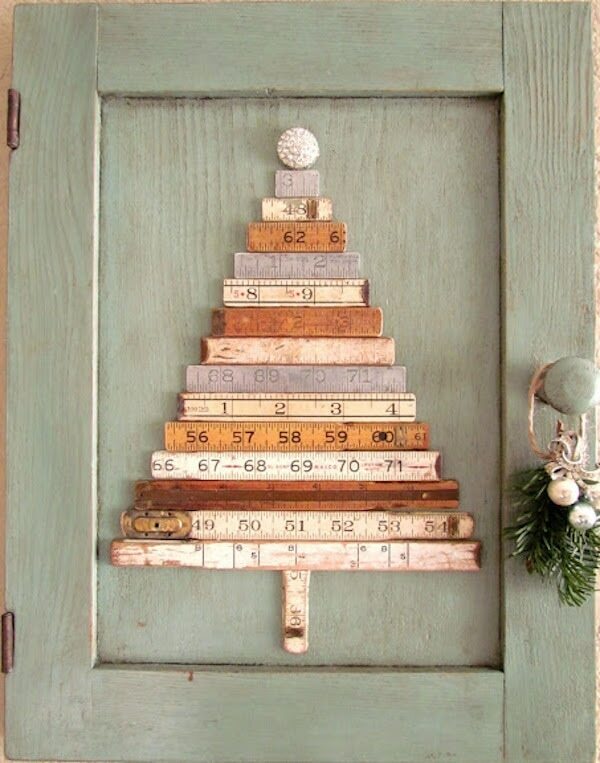 Vintage rulers work especially well, but you could also go for a modern look. SImply cut your rulers to varying lengths and glue them to a small cabinet door or other wooden base. There’s something a little magical about trees covered in wispy feathers. 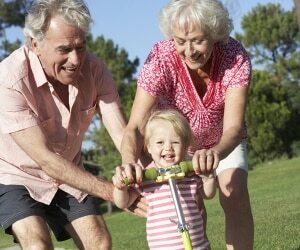 You can use all white plumage or natural browns, or a combination of both. Buttons act as adorable ornament substitutes on this twiny little tree. 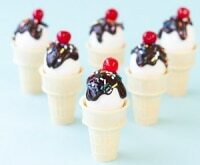 To create your own, wrap a cone base with twine, then glue on buttons. Top it off with a touch of diamond dust. 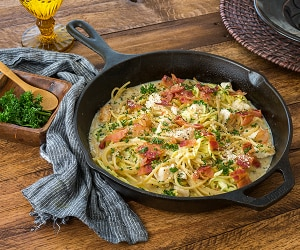 Forget a white Christmas- why not go for a seaside-inspired noelle theme. 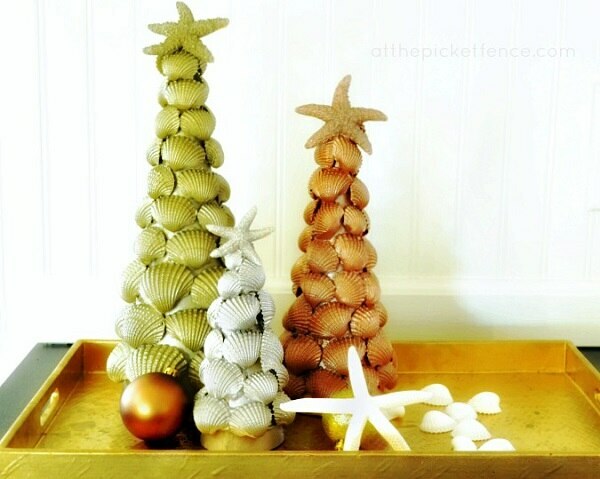 To make these beachy trees, glue seashells to a cone base, then spray paint. Who knew spoons could be so pretty? 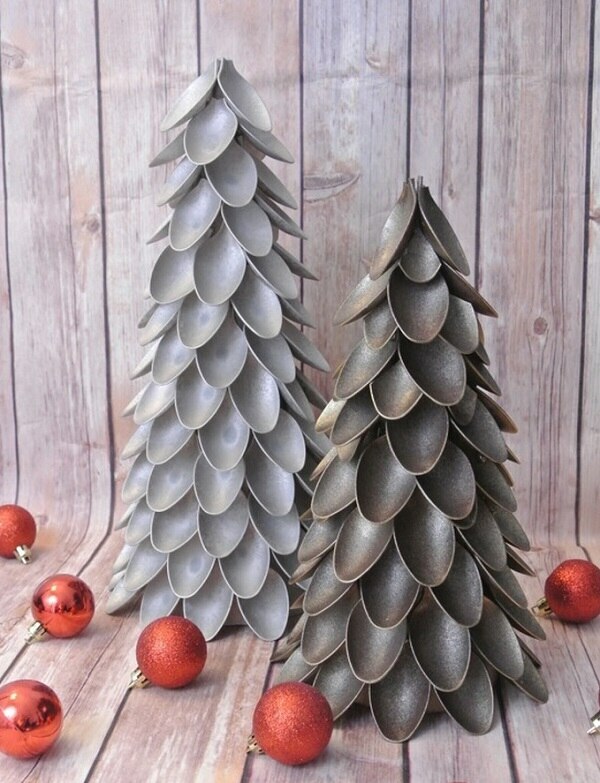 Adhere the ends of spoons to a cone base, then spray paint to create this textured trees. Brown and gray hues are subtle and chic. 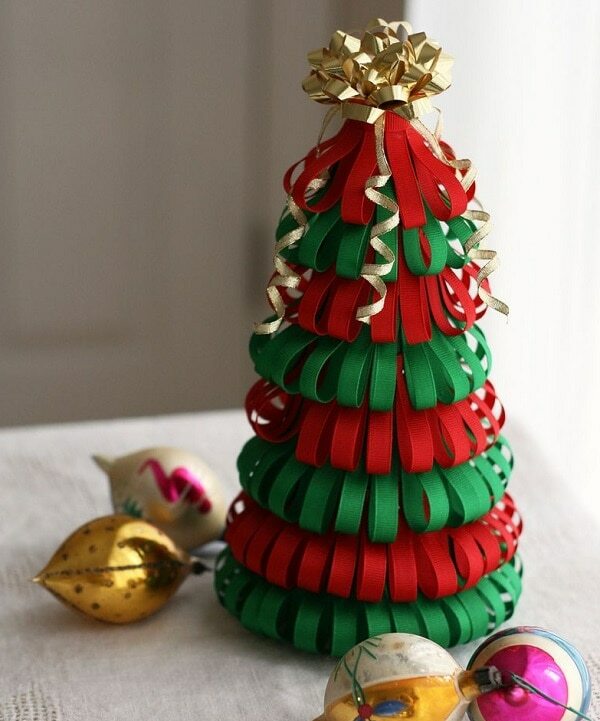 This loopy tree is made out of folded pieces of ribbon. 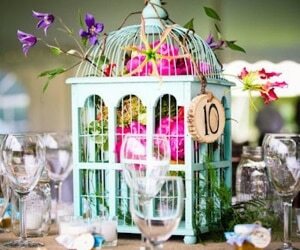 Red and green are classic, but you could use a neutral palette or even pinks and purples. A gift bow is the perfect tree topper. 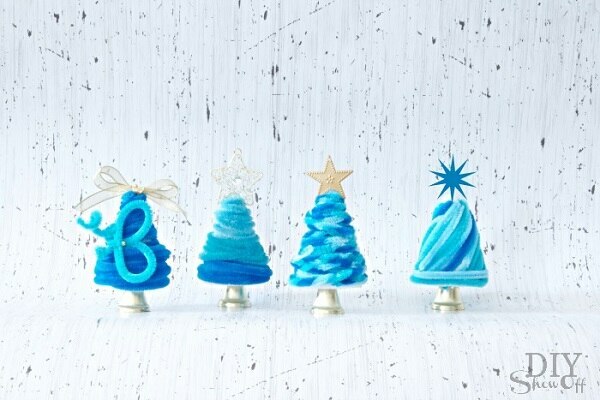 There’s no trick to making these vibrant and playful little Christmas trees. 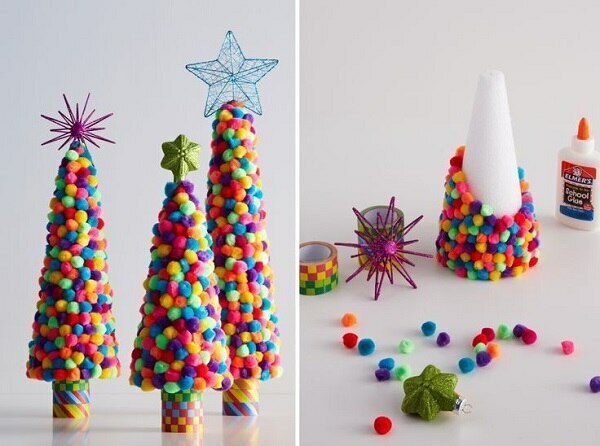 Just cover a cone base in lots of little pompoms, and stack several colorful tape rolls under the base to create a trunk. Top with a pretty star ornament, and you’re done. 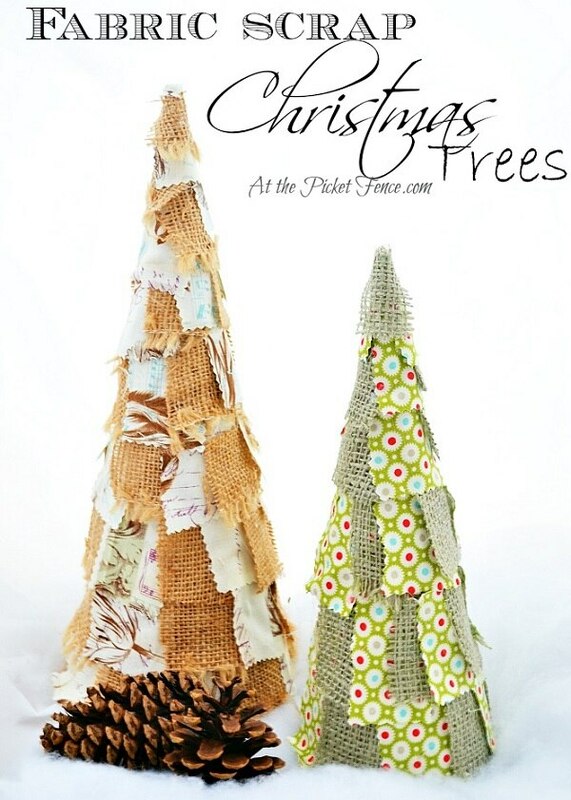 Combine patterned fabric and burlap to make these beautifully patchworked trees. 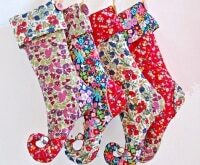 You could mix several prints in one tree for an even more up-cycled look. 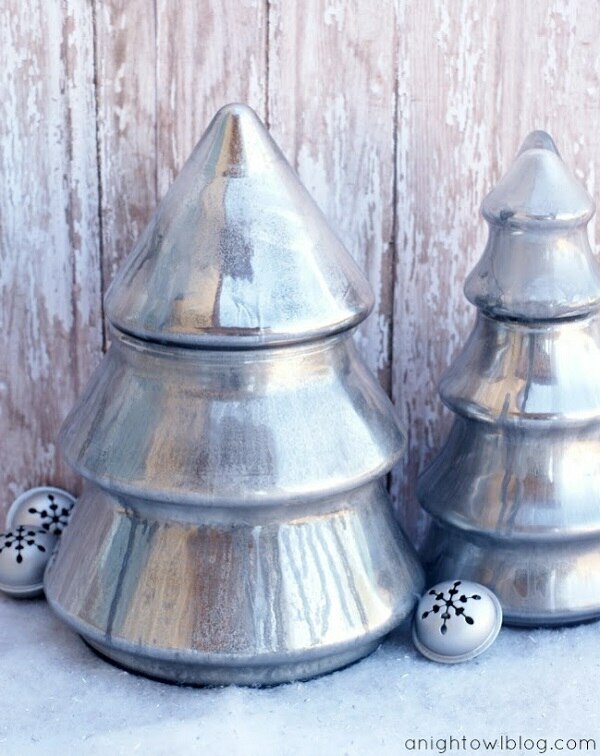 Get the ethereal look of mercury glass for a fraction of the cost. 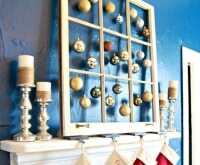 Simply spray paint glass trees with a combination of Krylon Looking Glass Spray Paint and zinc acrylic paint. 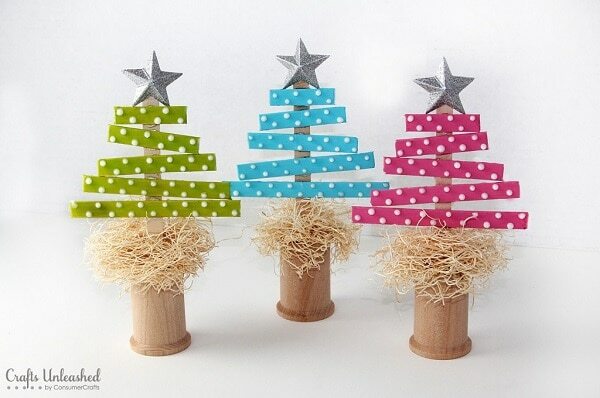 These adorably wonky trees are made out of colorfully painted craft sticks decorated with puff paint. A wooden spool base with a touch of fuzzy excelsior creates the stump. The neutral hue and straw-like texture of burlap look good in pretty much any setting. 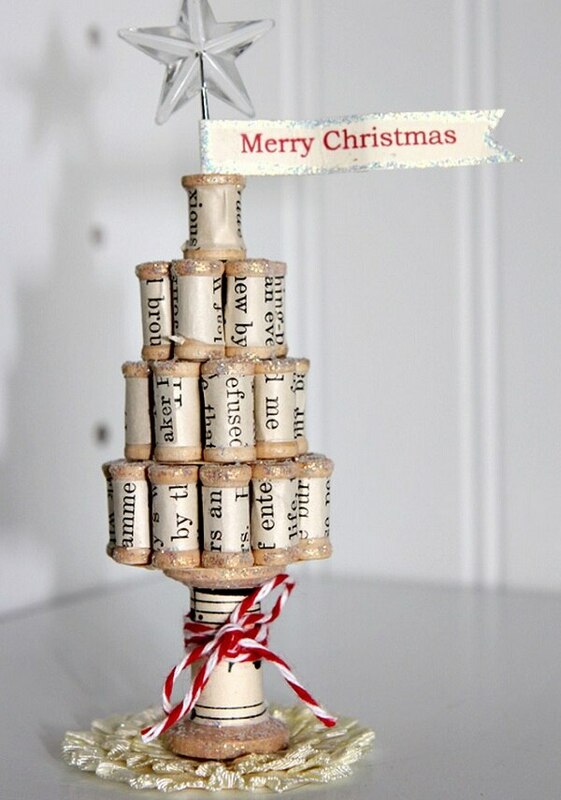 To make this shabby chic Christmas tree, layer folded burlap onto a cone base. This antiquey Christmas tree is full of character and charm. 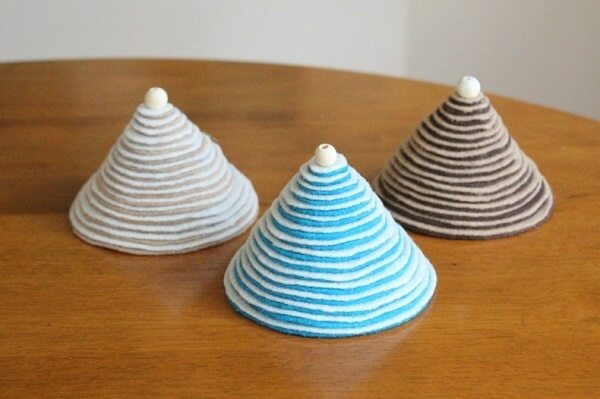 To make, cover wooden spools with vintage sheet music or old book pages and stack them into a pyramid shape. 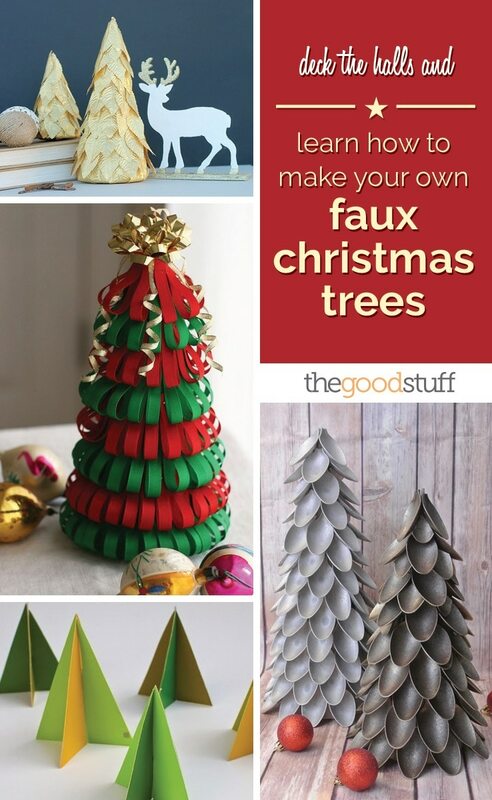 Think outside the evergreen box this year with your Christmas tree decor. 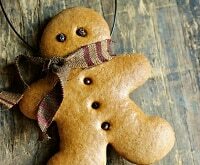 Turns out this quintessential yuletide feature comes in all shapes, sizes and materials. 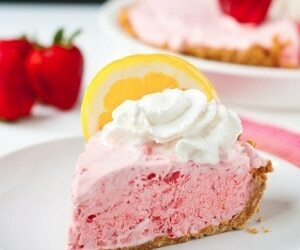 Many of these projects begin with a simple cone base; others are constructed from scratch. 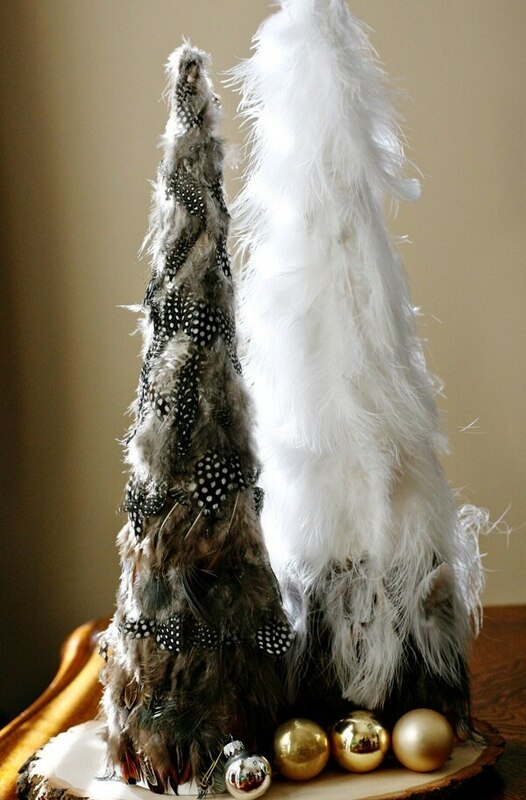 Whatever approach you choose, have fun creating faux Christmas trees that suit your style and holiday spirit.